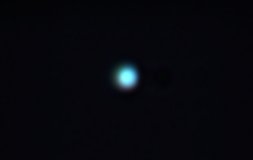 Ok, so tiny may not be the best word for an ice giant 14 times heavier than the Earth, but is sure doesn’t look big from 3 billion kilometers away. Uranus does not have much (atmospheric) surface features to begin with and they will certainly not show in a relatively small scope without special filters. I was hoping to see some of the moons but apparently conditions were not good enough. This entry was posted in Amateur Astronomy by chrfrde. Bookmark the permalink.